Celebrations honouring the dead are prevalent among many ancient cultures, sharing similar religious commonalities, sadly lacking in modern European religiosity. During a pilgrimage to Mexico I was privileged to witness and participate in the ‘Dia de los Muertos’ held November 1st –2nd each year throughout Hispanic America. Originally it would have been celebrated in the Aztec month of ‘Miccailhuitontli,’ roughly equivalent to the Gregorian months of July/August. Naturally, the colonising Spanish prohibited this festival and moved the greatly sanitised theme to November, supplanting it by their own Feasts for All Saints and All Souls. Despite the obvious Catholic overlays, this festival remains primarily Mesoamerican, revealing many indigenous celebrations of death and ancestry. Preparations begin in early October with the cleaning and repairing of family tombs. When festivities finally get underway, the 1st of November is dedicated to ‘los angelitos’, the little angels: the souls of departed children. Flowers and candles adorn the gravesides as the family hold their evening vigil, storytelling and singing until dawn. Native Creation accounts maintain a frequency of stories relating to the first human couple as the ancestors of mankind. 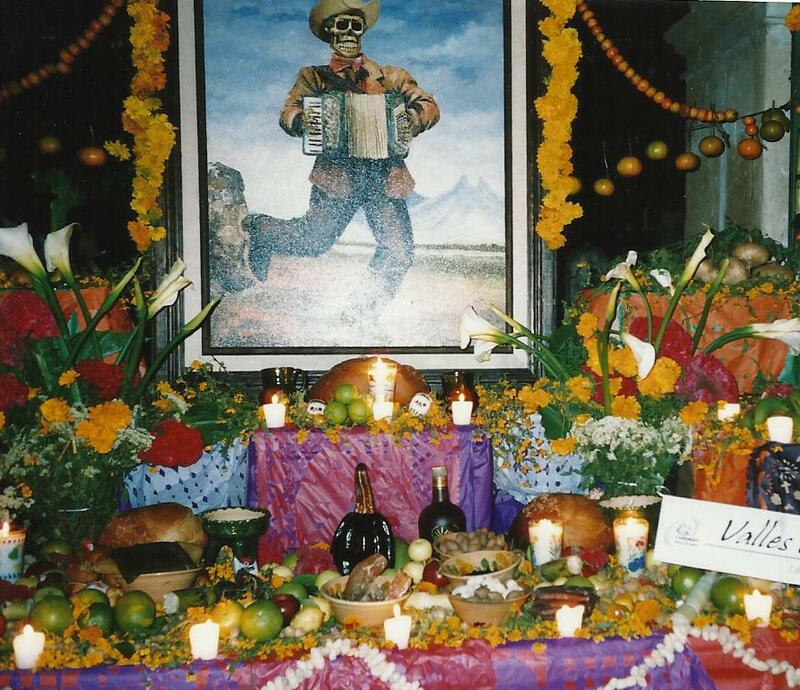 These are honoured today in the tales told to their descendants during the ‘Dia de los Muertos’ celebrations. 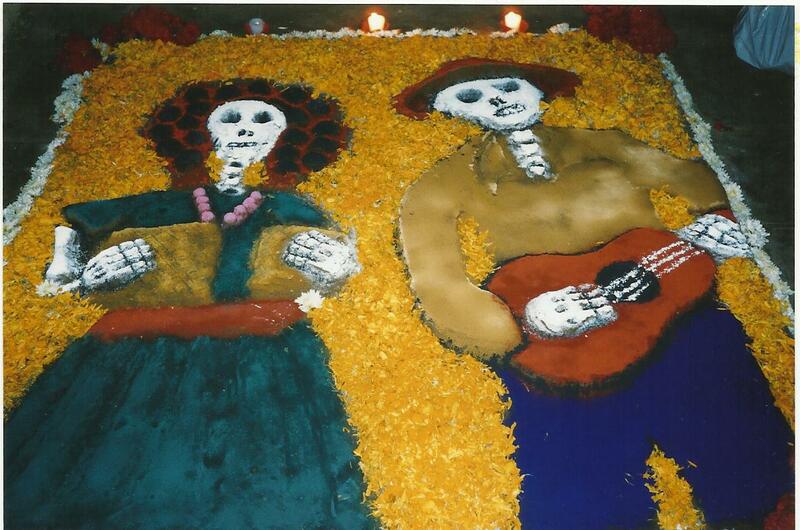 As dusk falls, the 2nd of November is dedicated to ‘Los Muertos’ the dead adults to whom food, tequila and cigarettes are offered alongside ritualistic flowers of the dead –‘cempazuchitl’ (marigolds) whose perfume blends perfectly with copal, burnt upon graves and altars throughout Mexico. Mariachi bands accompany masked dancers, whose grinning skeletal faces gleefully mock death in this ceremony that celebrates our mortality as a beginning rather than an end of life. This evocative pageant to Death expresses intense devotion and veneration of Death itself whose final deliverance is deemed to come almost as a saviour from the toils of life. Fireworks and folklore drama full of sexual innuendo complete the carnival atmosphere. 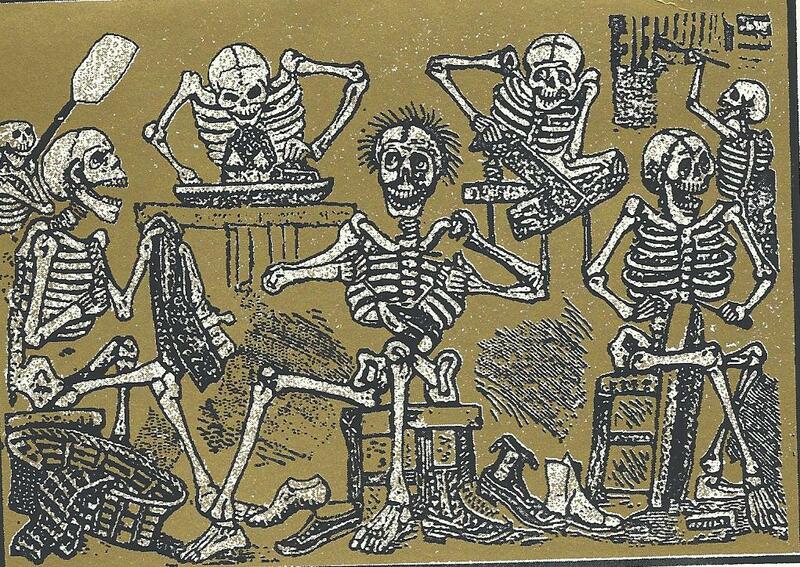 Children pull playfully on skeletal marionettes of death, the stark reality of which parallels every day. There is no Catholic duality here, no fear of death, just a dynamic unity in opposition. Colour pre-dominates the scene as fire and candles illuminate the night glowing orange, the colour of the flower of death. Fruits, costumes and masks appear in abundance decorating the doorways of shops and houses everywhere. It is still believed that flowers given as sacrificial offerings are at the behest of Quetzalcoatl who instructed his people to give only these and butterflies in lieu of human flesh. 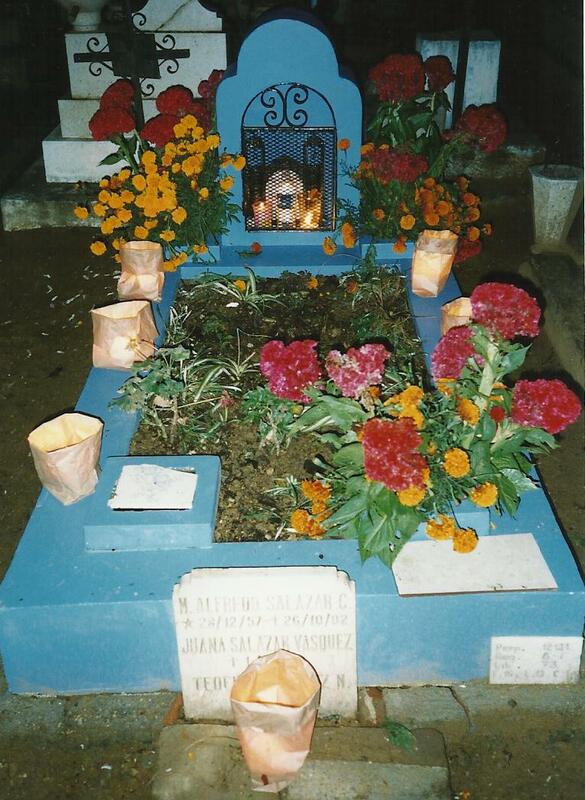 Upon entering the many Cemeteries throughout Mexico, everyone is offered steaming bowls of rich, dark hot chocolate and ‘pan de muertos’ (bread of the dead), which is a shared consumption between the living and the dead. After blessings, these ‘dumb’ suppers are removed from ‘offrendas’ (private altars) for the public in what anthropologists recognise as the ancient tribal activity of ‘re-distributive’ feasting. Spectacular, imposing shrines line the quadrangle of tombs, dedicated to past dignitaries and revered members of the community. Constructed of arched reeds and sheaves of corn, the shrines are adorned with garlands of tangerines and flowers. Water too is set out to slake the insatiable thirst of the dead. Immense national pride and civic prowess among competing teams guarantees a magnificent display, mindful of disqualification for the introduction of foreign elements i.e. pumpkins and cauldrons. Candles illuminate photographs of all persons honoured and are often accompanied by ‘Calaveras,’ poignant yet satirical eulogies extolling pertinent virtues and vices of the deceased. Delicate lacy paper patterns of figures and symbols relating to death also decorate these shrines in honour and remembrance of intricate paper hats worn by ‘Mictlantecuhtli’ the Aztec Lord of death (synonymous with the Mayan ‘Ah Puch’). Marzipan and candied fruits sit among sugar and amaranth skulls, symbols of the gods of death, highlighted with red and black spots, redolent of putrefaction, convincingly depicted in decorative coloured icings. Hundreds of years ago, during the months of ‘Panquetzaliztli’ (approx November) and ‘Toxcatl’ (approx April), amaranth seeds of the ‘huala’ plant were finely ground and mixed with blood and honey to form a stiff dough. Shaped into deific skeletal figurines, primarily of ‘Tezcatlipoca,’ but also ‘Huitzilopochtli’, they were hung high upon the Xocolli tree and worshipped. Finally, they were taken down and consumed by ‘tecuelo’ (meaning quite literally – god eaten) participants, a ceremony with such a startling similarity to the Eucharist, it was suppressed by Spanish missionaries. Pulque, a milky alcohol, likened to the mothers’ milk, fermented from the sap of the maguey (Agave) cactus, is still consumed as a ceremonial drink in place of ritually revered traditional hallucinogenics such as datura and morning glory. Magnificent sand ‘rugs’ decorate the stone slabs of the courtyard satirically portraying skeletal brides, bandits, dancers and musicians: death here, is a welcome inevitability. Included in these intricate designs are the images of butterflies and humming-birds, reflecting the Aztec belief in the immortal soul returning from the Underworld, now visually celebrated in the Autumnal return of the monarch butterfly in from Canada and the USA. For the Aztecs, the Underworld, though fraught with trials and tribulations was no Catholic Hell. After a harrowing journey and judgement, Mictlan was the final destination of nine levels in the Land of the Dead with many Classic funerary pyramids constructed of nine levels reflecting this. Laying to the West, Xibalba, the Land of the Dead could also be entered through caves and bodies of water known as ‘cenotes’, sacred water cisterns, places of ritual sacrifice to the Lord and Lady of Death – ‘Mictlantecuhtli’ and ‘Mictecacihuatl.’ Bodies were buried with grave goods of Jade beads, food and chocolate to be offered as payment upon reaching ‘Mictlan’, the final level of the wandering soul. People reflect and embody regenerative process and so death is perceived as a cyclical symbiosis, from which life evolves. Moreover, the regenerative life cycle is connected to that of the maize, which is seen to spring from the ground nine days after the seed is planted. Mirrored in the emergence of life from the nine fleshless realms of ‘Xibalba,’ death was thus viewed as a descent into the world of spirit. Skeletons as powerful symbols for new life are depicted in many art forms, more commonly as masks where skeletal faces are drawn back to reveal the fully fleshed life latent within. Bones, like seeds are cyclical; hence life comes from death and is not to be feared. Complex cosmologies emerged woven around the life giving maize, life from the earth and the fertilization of blood spilled upon it by the first couple and the creator gods. Ancestor worship in Meso-America is celebrated in Classic Mayan art, filled with scenes of priests and rulers offering back their blood and other sacrifices to the honoured dead. 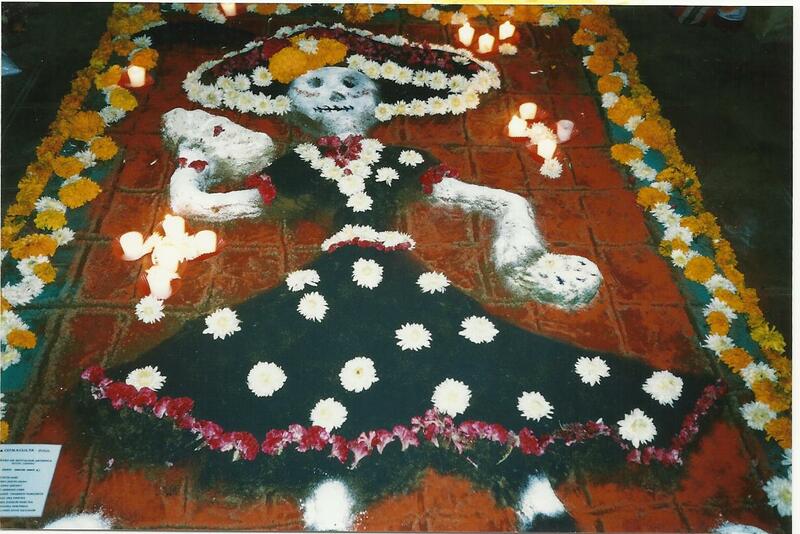 Paralleling these ancient concepts clearly evidenced within ‘Dia de los Muertos’ celebrations is the recent rise in popularity of the ‘Cult of Santisima Muerte’ (Saint Death) who has subsumed the role of ‘Mictecacihuatl,’ the Aztec Lady of Death. As a robed female skeleton she is unashamedly called upon for all kinds of material comfort – in life. Reflecting the rise in neo-pagan/Hispanic syntheses over recent years, various commonalities prevail. Candle magic and colour correspondences dictate votive offerings for use in ‘requests’ to her; cloaks worn may for example, be black for power and vengeance, or red for affairs of the heart. Household shrines to her are lit daily with relevant flowers, food, water, tobacco and even where necessary, liquor. An evening kiss secures her good favour and fortune throughout the night. Her popularity is fast exceeding even that of the Virgin of Guadalupe in Mexico City, with thousands buying water and holy incense dedicated to her, though she is not, of course, recognised by the Catholic Church. There is even an annual ceremony for worshippers to celebrate her birthday. Text extracted from Chpt – Dia de los Muertos: Tubelo’s Green Fire by Shani Oates. All photos credit and copyright of Shani Oates. ~ by meanderingsofthemuse on October 26, 2011.